Clinger Holsters makes highly concealable SIG P320 XCOMPACT holsters. We pride ourselves in making small holsters that conceal better than any other holster you’ve tried before. Consequently, by shaving off every possible square inch of material, you’re left with the perfect sized concealed carry holster. 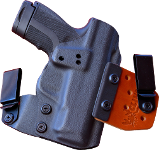 Most other holster companies don’t consider the footprint of the holster the way Clinger does. However, it’s important to ensure a SIG P320 XCOMPACT Kydex holster is as small as possible because plastic is just not comfortable. The more plastic that’s on your IWB holster, the more material your shoving down your pants. Even SIG P320 XCOMPACT OWB holsters are more comfortable if they’re smaller. There’s another benefit to small rigs other than comfort though. Smaller rigs conceal better too. Essentially, the bigger the holster is, the more likely it is to print through your shirt. Hence, smaller rigs just plain conceal better. Yet another consideration to concealing a pistol the size of the SIG P320 XCOMPACT is getting the grip of the pistol pulled in close to your side. Because it’s really important to get the grip pulled in close to your side, your gun will print if it’s not. Above all, the best SIG P320 XCOMPACT concealed carry holster we make for outright concealment is our No Print Wonder. Moreover, it uses our Cling Tab system to get the grip of your Sig pulled in extremely close. The Flex Tab bends around your waist which allows the stiffer Cling Tab to pull the grip of your SIG P320 XCOMPACT in really close. For that reason ,Clinger Holsters puts more thought into concealment holster design than anyone else. Our Stingray is perfect for concealing quick and easy. Because it uses a single belt clip, it’s incredibly easy to put on an off your belt. However, the width and strength of the belt clip makes the entire rig very stable and secure. Therefore, you will not have to worry about your gun walking around your belt. It’ll definitely stay where you mount it. Clinger also makes the Ultra-Conceal OWB. It uses the same Cling Tab system as our No Print Wonder. Therefore, it actually conceals as well as an IWB rig does. That is truly groundbreaking. Because the Ultra-Conceal OWB uses the same platform as our No Print Wonder, it’s very easy to convert it into the No Print Wonder for IWB use. Likewise, all that has to be done for the conversion is to swap out the clips. No matter what type of SIG P320 XCOMPACT holster you’re looking for, Clinger has it.